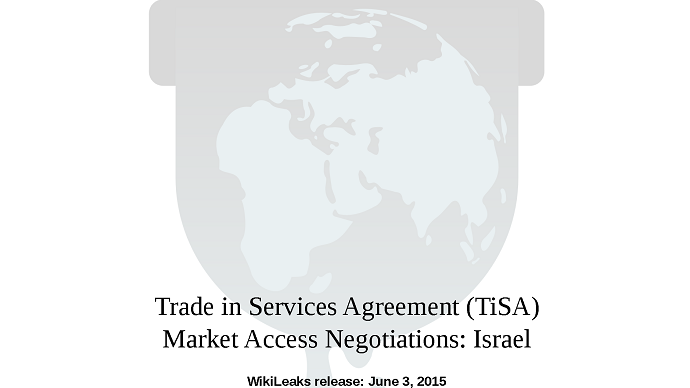 The documents released by the transparency group are allegedly associated with TiSA (Trade in Services Agreement) negotiations, which have been taking place in secret since early 2013. The participants of the talks include 24 WTO members, such as the US, EU and other countries including Turkey, Mexico, Australia, Pakistan and Israel. The European Commission web source says the participants in the agreement, which is set “to liberalize trade in services,”“account for 70 percent of world trade in services.” The “talks are based on proposals made by the participants,” the EU source adds, saying that “TiSA aims at opening up markets and improving rules” in a number of areas, including financial services, transport and e-commerce. A number of the world's economies, including all the BRICS countries – Brazil, Russia, India, China, and South Africa – are excluded from the TiSA negotiations, which purport to benefit the global economy. “It's a dark day for democracy when we are dependent on leaks like this for the general public to be informed of the radical restructuring of regulatory frameworks that our governments are proposing,” Dearden said in a statement on Wednesday. The agreement is part of the strategic “T-treaty trinity”: the Trans-Pacific Partnership (TPP), TiSA, and the Transatlantic Trade and Investment Partnership (TTIP). It complements the other two global trade agreements dealing with goods and investments, which are all currently being negotiated in secret. TiSA is believed to be the largest component of the three.